A mix of side-to-side and front to back curve feather curve lets each kind of bird fly in their own special way. Quick but short bursts of flight like seen in pheasants and a lot of songbirds. The first primary flight feathers of these birds are super-curved from side to side but not so much front to back. This makes for a quick lift-off. Think of a forest grouse that explodes off the ground, usually scaring the bejeezus out of anyone close by. Soaring flight like vultures and eagles. The main flight feathers have some front to back curve or camber. My sister showed me a huge Wood Stork primary feather from Tanzania that had so much front to back arc camber that five of them would make a full circle. Fast flyers like swallows, ducks, and falcons or gliders like seagulls. Their feathers usually have less curve both side to side and front to back. Other aspects of wing flight feathers like their shapes let them do what they do in flight. 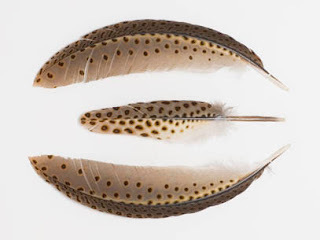 Which is a good subject for an upcoming series of blog articles: shapes of feathers. There is way more to flight feather curves than what I have outlined here. A good source to start with is the 2010 book, Bird Feathers: A Guide to North American Species, by David Scott.